According to comScore, “… over 25% of Internet users play online games every week, which is over 200 million users worldwide”. To cash on this number of ever growing netizen playing games, here is “Google Adsense for Games”. 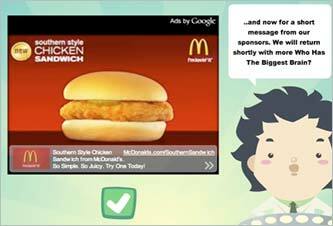 You can display video ads, image ads, or text adsÂ within your online games to earn revenue. Since it is a game and not a usual webpage, ‘Adsense for games’ allows you to show interstitial frames before a game, after a level change, or when a game is over. Besides these special formats, you will also see usual contextually targeted text and image ads based on content and demographic information. This is a beta launch with strict entry guidelines. An eligible publishers must have a minimum of 500,000 game plays and have 80% of their traffic from the U.S. or the U.K. Here is the link to sign up for this program, if you meet these requirements. I'm a PC Gear is out on Zazzle, wanna buy ?